Has someone in your house got the back to school blues? Twelve months ago I became a school mum for the first time. My five year old was off to Primary School. It was a big step. He has never been a child who coped well with new things and he did NOT like to be separated from me but he loved his preschool year and I figured that starting school might be a little nerve-wracking at first - for both of us – but we’d get into the swing of it after a week or so. Well it took him about five weeks to settle in. Five weeks until he stopped asking me to stay in the classroom with him. Five weeks until he would sit at his table and start the morning’s activities, chatting to his classmates, rather than hanging firmly by my side. It was five weeks before, on pickup, he said he had a great day and regaled me with stories of what he did at play time rather than tell me it was, ‘okay’ and nothing more. I expected this stuff. I know him well. What I did not expect was the tantrums, the acting out and the generally difficult behaviour that occurred in the two weeks before school even began and well into those first five weeks. Starting school, and starting a new school year after the long summer holidays, can be a cause for real anxiety for some kids. Complaints of physical symptoms such as headaches, stomach aches, nausea, and diarrhoea. These might occur in the days, maybe even weeks leading up to the start of the school year but may be particularly prevalent in the hours before you set off on the school run. Kids, like adults, can be fearful of new situations and starting a new school year, even if they have been at that school for years already, is new and different. A new classroom, new teacher, new classmates. This can be compounded if there is something additionally new for your child this year. Maybe a new campus, new playground or even something exciting like a new leadership role. It’s all different and that can unsettle the best of us. Additionally, some children can harbour deeper fears that they may not be able to put into words; the fear that something might happen to a loved one while they are at school, or they may not do as well this year as they expect of themselves. Some kids may fear another student if they have experienced bullying or social difficulties in the past. Try talking to your child about what might be worrying them and reassure them if you can. This will be easier with older rather than little kids who might not yet have the language and ability to understand or express their fears. Even older kids might find it tough, however, and you might need to do a bit of probing and careful questioning to uncover the issue. Explore and establish a support system at school. Chat to you child about friends they have in their class, teachers or other staff they feel comfortable with and who they might go to if they are feeling sad or anxious at school. 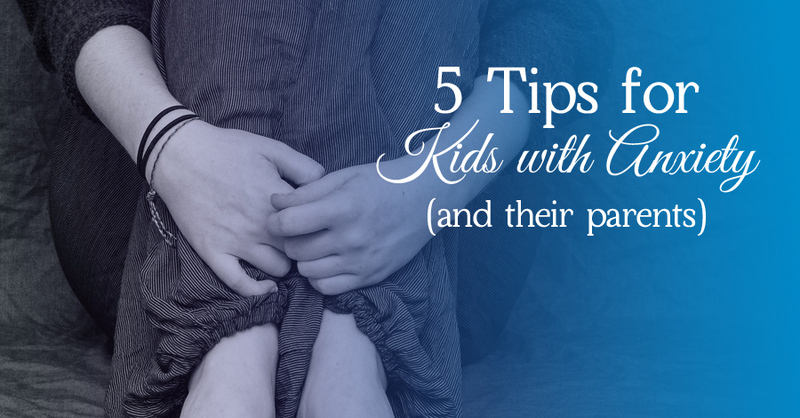 Relaxation is great for kids and adults alike when dealing with anxiety. Simple, kid-friendly mindfulness techniques can help kids to get less caught up in their thoughts and worries. Lying in bed and listening to outside noises such as birds and street sounds for a minute or on waking can help set them up for the day. Get them out and about to play. This is a great distraction if kids are getting anxious about the approach of the school year. Physical play like running, trampolining, climbing, swimming, ball play and bike riding does wonders for kids’ mental wellbeing as well as their physical health. It also helps their sleep, their concentration, their social skills (when playing with others) and it has been shown to help their ability to cope with emotional challenges. Laughter! This is a wonderful way to shift a negative mood to a positive one and it has been shown to soothe physical tension and to help the body relax. Pull funny faces, tickle, make a joke or watch silly cartoons. A great distraction from anxiety too. My boy hasn’t shown any signs of worry about the beginning of the new school yet but two weeks is a long time when you’re six. I have no doubt there are tantrums and difficult behaviour on the horizon. But I know what to expect this year and I know what to do about it. Hopefully you do now too. P.S. If anxiety about school continues for more than six weeks into term, if you are concerned about the degree of anxiety your child is experiencing or if symptoms of school anxiety are becoming too difficult to manage please see your GP who can refer you to a psychologist. Many psychologists are now able to bulk bill their services through Medicare. Ellen is a Psychologist, writer and mum. Melbourne-born she spent most of her 20s and 30s in Sydney and now lives in beautiful Ballarat, in the Victorian Goldfields. Ellen writes stuff to inspire, to inform and sometimes to challenge. She knows a lot about how people work at work, how people are different and unique and how people make the most out of life. Ellen blogs at www.potential.com.au. If you’d like to ask a question or share a story she’d love to hear from you. You can email her at psych@potential.com.au.